Time for a catch up….. Sorry we’ve been off-air for a few days. I’ve been struggling to get a stable internet connection, but I think I've sorted it out now. The old laptop isn’t what it was…. But it’s like an old pair of slippers. Getting a bit shabby but so comfortable you can’t bear to throw them out. Or an elderly aunt, much loved but a bit quirky and forgetful sometimes. Now let’s see… wow, it’s been a week since I posted last! 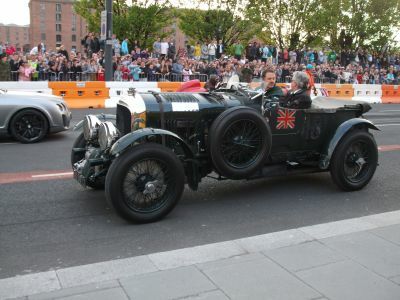 We had an interesting few days in Liverpool Docks, the highlight of which was The Pageant of Power on Tuesday evening.Over the wall in Canning Dock were jet-skis, in our dock power boats were racing up and down, and up on The Strand, a closed mile or so played host to performance cars and motorcycles, classic and modern. 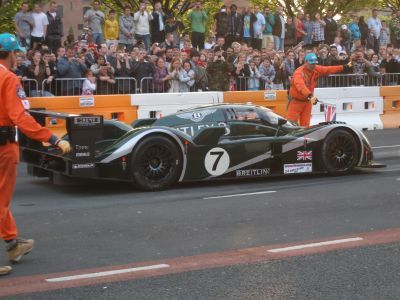 Certainly one for petrolheads! 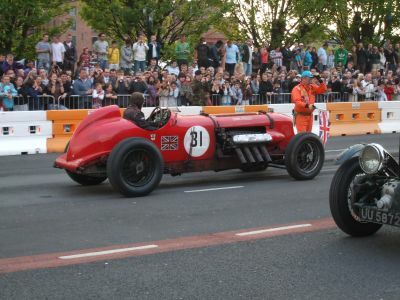 An excellent event, it was a taster for the proper pageant at Cholmondeley in July. 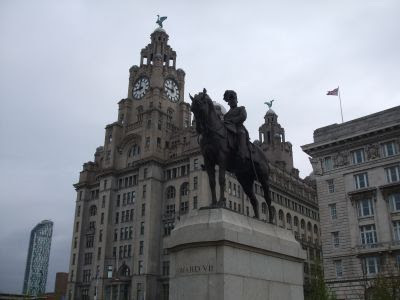 I spent the best part of a day mooching around in the Merseyside Maritime Museum, but was surprised that the busiest section was the International Slavery Museum on the top floor. A bit of a guilt trip? 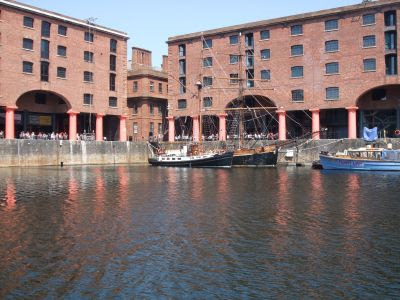 It is estimated that 1 in 10 of the people destined for slavery in the New World passed through Liverpool Docks. 1.5 million people…. 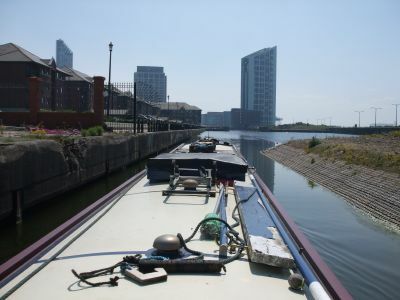 Just walking around the docks is interesting…..
Our visit ended on Thursday morning, when, with 3 other narrowboats and a Dutch barge, we congregated at Mann Island at 08:30 to start the trip back. Not such a nice day as when we came down, cooler and with a bit of a breeze. 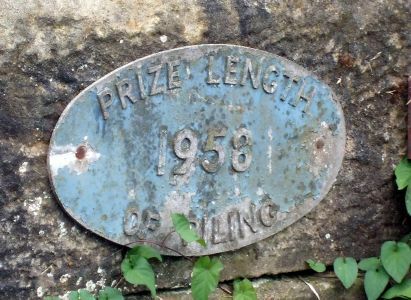 A lot of the bridges on the main line were rebuilt and widened in the 19th C and carry this plaque. 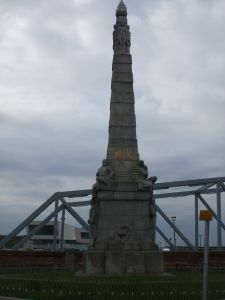 We made a stop at Litherland services for the usual amenities, then had to queue up, waiting for the BW men at Netherton Swing Bridge. 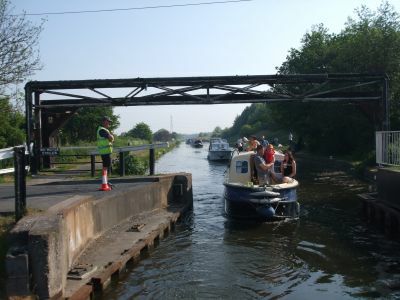 Then, after being let through Hancocks Swing Bridge, we said goodbye to the BW guys and carried on, finally mooring at Bridge 20a, near The Scarisbrick Arms. A long day, but enjoyable. The following morning Meg and I had a walk back down the canal to Coxhead’s Swing Bridge, and came across a cruiser wedged across the bridge. 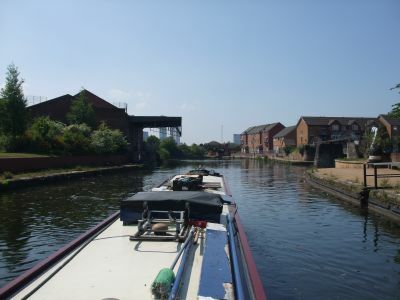 Nobody aboard, so I tied her up to the bridge landing stage, and called BW Wigan to tell them. I was concerned that the owner might think it'd been stolen, it had drifted maybe ¾ mile in the stiff breeze. It’s mooring pins were still in the bank near where we’d moored. 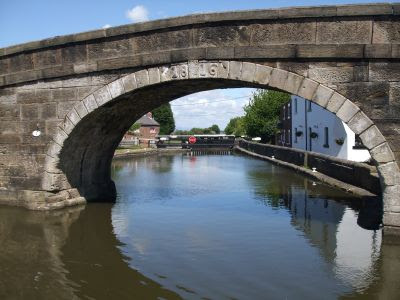 Friday we carried on, past Scarisbrick Marina, and into Burscough Bridge, where we pulled onto the wharf where the services used to be so I could nip up to the handy Co-op. 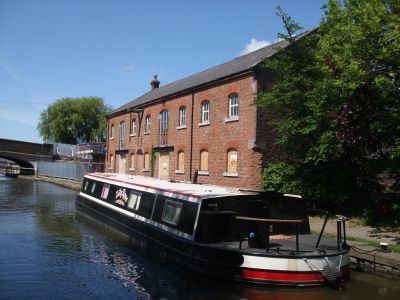 The site is being redeveloped, and new facilities will be provided “in due course”. Meanwhile it’s a handy shopping stop. Lock 1 on the Rufford Branch, through the towpath bridge. 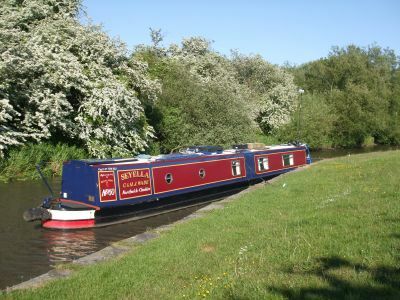 We moored at Appley Locks again, only this time with a little more trouble. 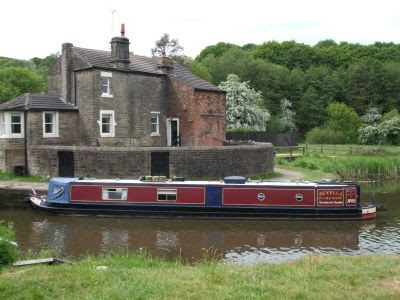 The pound above the locks was very low, and we couldn’t get very far up the old cut without running aground. After a bit of to-ing and fro-ing we finally got the bow in, but the stern had to stick out in the channel. No problem, though. 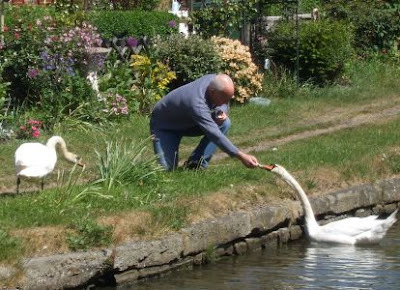 It’s not as if there’s going to be boats going past. 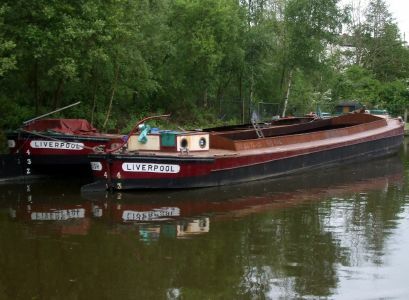 Sat on the bottom in Appley Locks old cut. 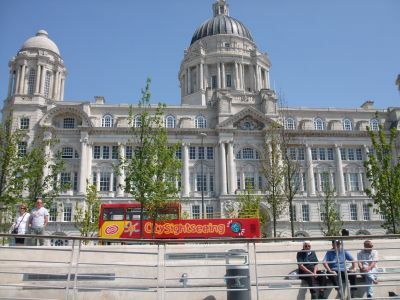 BW have got a potential problem with water supplies on the Leeds and Liverpool, apparently the dry spring has left the reservoirs lower than normal. 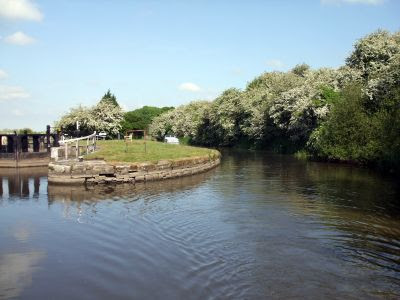 They’ve limited lock use to between 09:00 and 16:30 in an effort to conserve stocks, but a lot of boaters have been ignoring the restriction. 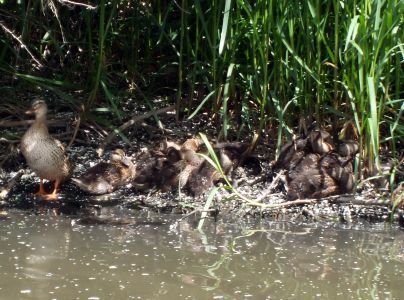 Mum keeping an eye out while the 12 youngsters doze in the sun. We left Appley this morning, with water levels up about 6” on Saturday’s lowest point. 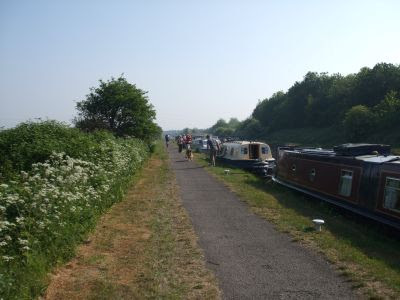 Even so, all the way along the stretch to Dean Lock you had to be careful to stay in the middle of the channel, else you risked running aground. Leaving Appley Locks. You can see the normal water mark on the “bull nose” between the locks. It still looks good after 52 years…. 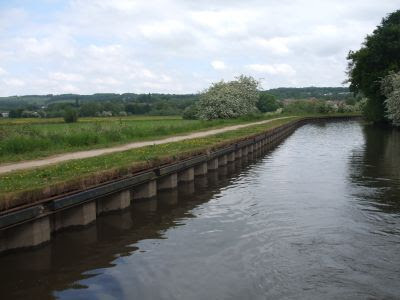 Filling with water at Dean Locks. 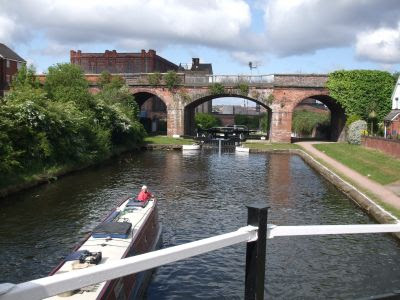 Above here, to the next lock, there was plenty of the wet stuff, then levels were low again below Pagefield and all the way into Wigan. 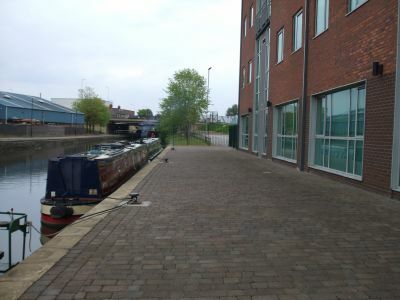 We decided to pull in on the visitor moorings outside the Wigan BW offices. 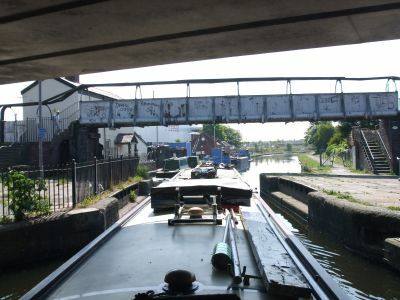 Had a bit of struggle getting close in here as well, but a boat coming down the lock above dumped 40,000 gallons of water into the pound, giving us just enough depth to get in. 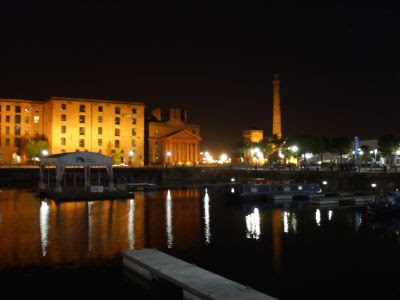 What can we say about Liverpool Docks and the Link? Well worth it. 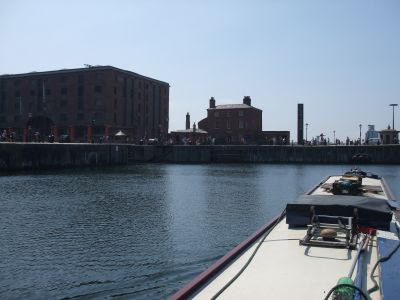 The docks are interesting, plenty to see and do in the immediate area. Then there's the city itself.... Full of history. 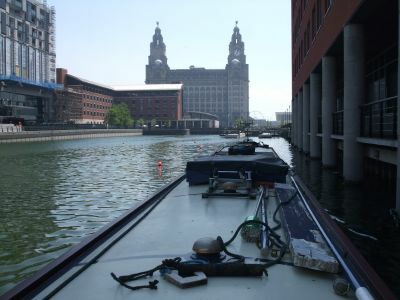 The BW crews who look after the trip in are friendly and competent, and the moorings are OK.
Just a couple of points. Dogs are NOT allowed in the Albert Dock Estate, though it was Tuesday evening before I realised. I wondered where all the rest of the dog walkers were... So it's not very dog friendly. And the electricity points on the pontoons are those that take all the credits off your prepayment card as soon as you plug it in. 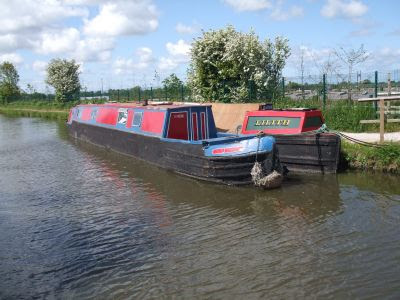 So if you shove a 25 unit one in, you'll lose the lot and leave lots of credit for the next lucky boater. We used less than 3 units (KWH?) in our 4 days there, so a 5 unit card should do for a week. And yes, we were "the next lucky boater"! Apart from the odd emergency vehicle sirening it’s way across the bridge in front of us, we had an undisturbed night last night. I admit to having had some misgivings; there were a lot of folk around here yesterday, some till quite late. But it was a warm Saturday evening so that’s to be expected. 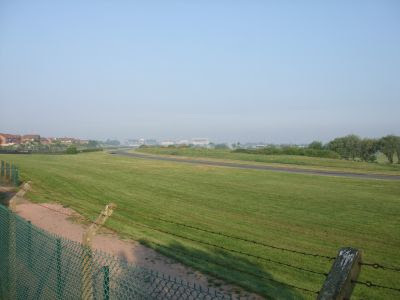 There’s an area of yet-to-be developed scrub and woodland between the road and Aintree Racecourse, and Meg and I had a walk around there, and alongside the famous track, this morning. Not a lot happening at 07:30 on a Sunday morning…. 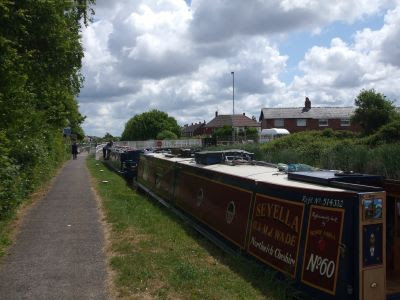 We got back, had breakfast and I was just checking out engine fluid levels ready for today’s trip when a convoy of boats appeared in the distance. It turned out we were not to be travelling solo today after all. 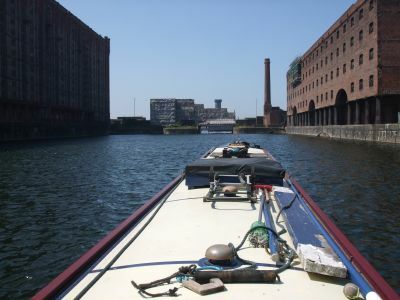 In fact there were seven of us heading to the docks. 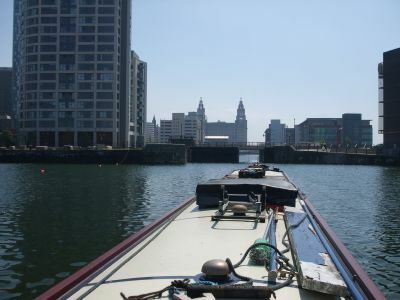 The arrivals are all members of the Mersey Motor Boat Club, based in Lydiate, and had left at 7 this morning to get here on time.BW were keen to get us going, so we were through the bridge and away at just before 09:00. On our way, we’re on point. 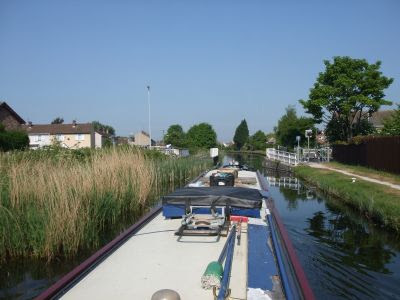 The route takes you through Aintree, Litherland and Bootle, and there’s a lot of greenery along the banks. There’s also quite a bit between the banks, with water lilies and reeds extending out into the channel.Still, the growth gives good cover for the water fowl, there’s a lot of chicks around. The bright sunshine was playing havoc with my camera settings, hence the very high contrast. 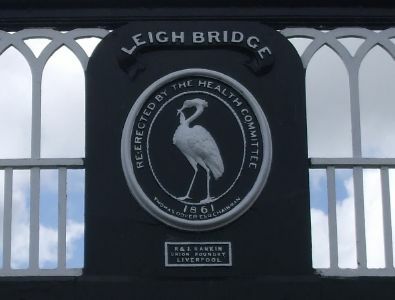 BW are responsible for opening the last swing bridge at Netherton, and then it was a clear run to Stanley Locks, with a brief stop at the BW depot at Litherland to empty a loo and get rid of rubbish. 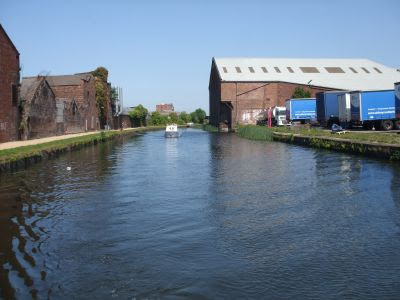 Coming into Bootle most of the green stuff is left behind, and the canal runs through a typical post-industrial area, with empty canalside warehouses, and small units in those that are occupied. 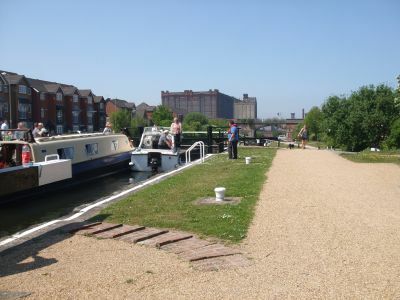 Just above the Stanley Lock flight though, redevelopment has taken place, and there are smart new houses and open spaces either side of the canal. 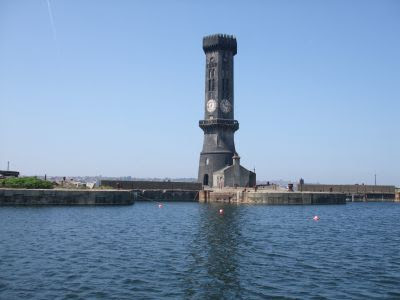 The basin, at the end of a short arm, has secure moorings. When the link was first opened the trip in took 2 days, with an overnight stop here. But it was more difficult to manage, so now it’s all done in one. Eldonian Village Although we were the second boat to arrive at the locks, we had to wait for the next locking down. 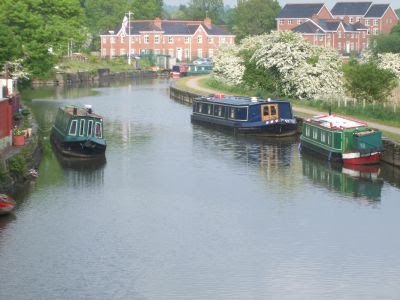 There was room in the broad locks for all three of the cruisers at once and they went down first. We were out of the flight and in the dock complex by about 1 o’clock. 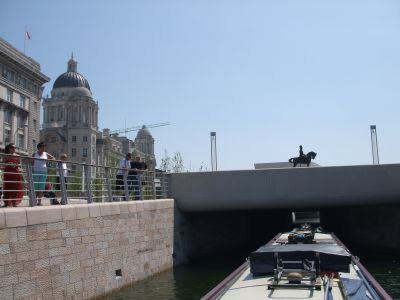 There’s a new channel been cut through the in-filled Trafalgar Dock…. Taking boats into West Trafalgar Dock, then through to Princes Half-Tide Dock. 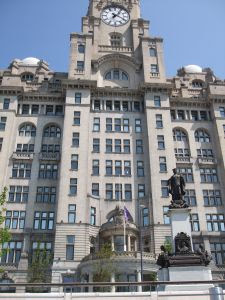 You catch the first view of the Liver Building here. 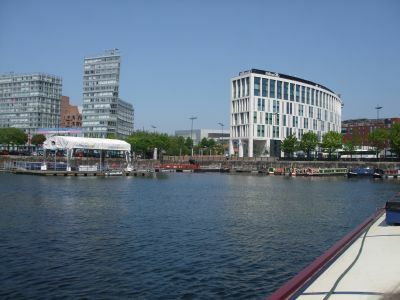 The new Princes Dock Lock is through the next gap, across Princes Dock. Princes Lock in the distance. 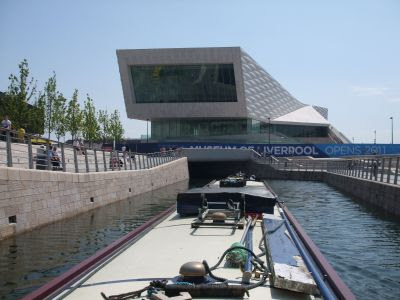 Out of Princes Lock there’s a series of new channels through tunnels under the developments around Pier Head, and the new Museum of Liverpool. 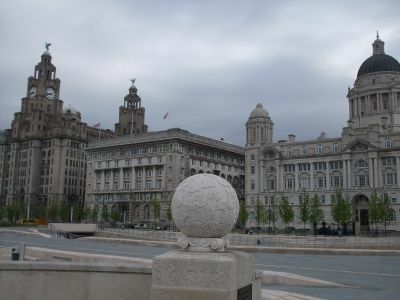 The Liver Building from the canal. 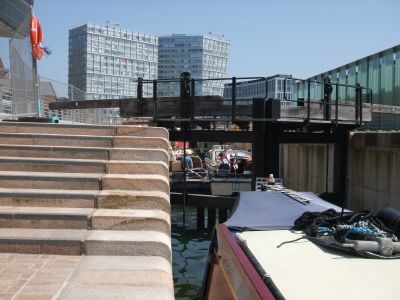 The second of the 2 new locks is at Mann Island, and the flotilla had to congregate here to wait for the all-clear from the Harbour Master before locking through into Canning Dock. Waiting for Mann Island Lock. 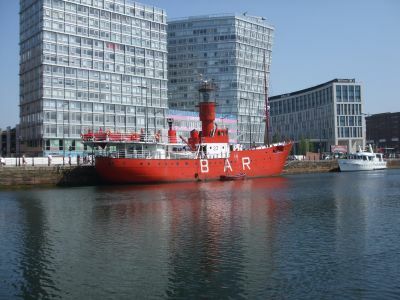 We got ourselves berthed, and I took Meg for a walk around the dock. 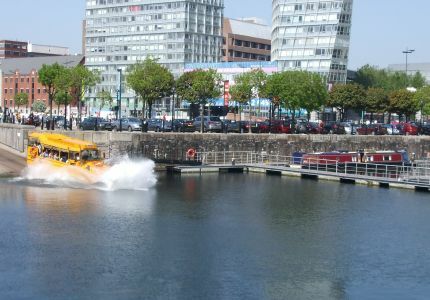 There are 3 ex WWII amphibious vehicles carrying passengers around the docks, and they use the slipway behind our mooring. On such a glorious day they were well patronised, and the customers (and I suspect, the crews) were enjoying the spray from the entry into the water. One of the “Quacker Whackers” going in. 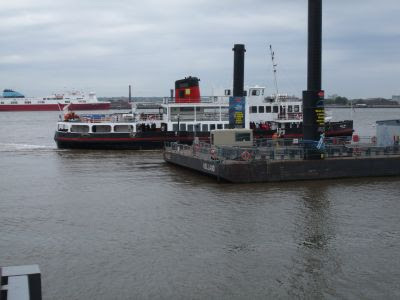 We’re moored on the right. 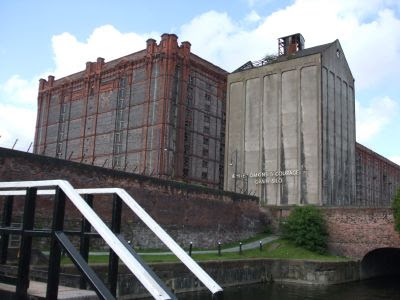 The guides encourage the passengers to sing as they climb back out up the slip. The song? 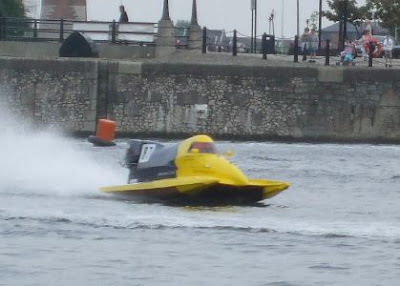 Not entirely appropriately – Yellow Submarine! 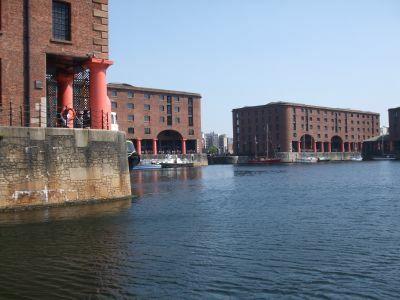 We really enjoyed the run through the docks. 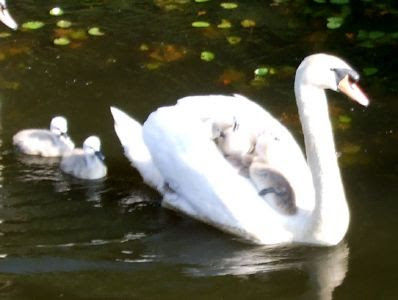 Something entirely different from our usual cruising. We’re here now till Thursday morning. A bit of exploring to do, I reckon. A very long post, this. Sorry about that. But a lot to see around here…. Still waiting…… And a chance encounter.